Decay, injury, and gum disease can lead to tooth loss. Missing one tooth or all teeth can be embarrassing for men and women, and cause them to hide their smiles. Fortunately, there are solutions for tooth loss such as dentures. At South Lakewood Dental, we offer patients in Denver and beyond various types of dentures to restore health and beauty to their smiles. Gone are the days of pink and white appliances sitting in glasses of water on your grandparent’s nightstand. Many people express concern regarding ill-fitting dentures that shift or fall out. 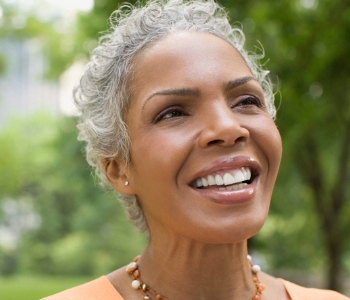 Rest assured our dentures are designed to fit precisely and blend naturally with the smile. Geneva AutoCentric™ Dentures – These dentures seat securely, allowing for optimal chewing efficiency. Patients do not need to worry about slipping, poor fit, restricted chewing, or sore spots. Blade edge technology is used for the back teeth. Denture adhesive is not necessary to secure these dentures. Fountain of Youth Dentures™ – With these dentures, we can improve the appearance of the smile and the face. Fountain of Youth Dentures™ are designed to distribute balanced pressure across the jawbone and gums, ensuring optimal fit and function. Some patients may experience a sunken facial appearance after tooth loss; however, these dentures can restore balance and proportions. Implant-supported dentures – Dental implants serve as tooth roots when placed into the jawbone. Dental implants can be ideal for supporting dentures, and potentially last a lifetime. After implants are placed, the dentures snap onto the implants. Patients can smile, speak, and eat with confidence with implant-supported dentures. Our dentist, Dr. Scott Stewart is a doctor of dental surgery. He has more than 30 years of experience transforming smiles with safe and effective treatments. He leads as the first dentist and naturopath in Colorado, to be certified by the American Board of Integrative Medicine and Dentistry and the American Naturopathic Medical Board. Dr. Stewart understands the connection between the mouth, teeth, gums, and the whole body. Therefore, he offers biocompatible treatments that are free of toxins. To schedule a consultation with Dr. Stewart, call (855) 233-0023.